Along with other preparations for the fast approaching CWGs, Ved Pohoja Associates, with help from MCD and NMCD has come up with a unique chain of info-cafes before the foreigners could even post their query, ‘Whither goest in Delhi?’ to fuel their quest for information and guide on Indian culture and Delhi heritage and the other two cities of the golden triangle: Agra and Jaipur. Nothing could be better for the time pressed foreigners who would want to make the most of their short visit at this time. To celebrate the same, our chief minister, Sheila Dixit opened the first café at Birla Mandir on Monday amidst much fanfare, music and revelry where they matched steps with their Indian counterparts on the beats of Dhol to celebrate its arrival. Another one was unveiled by Mayor Prithvi Raj Sawhney near the Red Fort. Mr. Kapil Sachdeva, the operational and lifestyle head of Ved Pohoja Associates, the company behind this unique 40 café chain that have been planned to open across the city shortly, informs that, "The cafes thrive to provide an easy flow of information through the touch screens which will basically have 7 information categories. While providing information on CWGs, tourist attractions in Delhi, its culture heritage, shopping areas, admired food and eateries, lodging and night life and the various modes of transport for reaching these destinations, the programme will give details of ATMs Police Stations, Hospitals and other important places of interest as well". 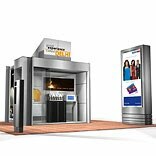 Designed in steel body, wooden flooring and APC water proof walls, the kiosks are capable of challenging any emergency, though the size is small (10x10). Along with the information on 30x20 inch touch screens, they will be selling merchandise as souvenirs with city branding, selling T-shirts, bags, caps and mugs with themes like “I Love Delhi" and" Delhi Dilwalaon Ka" under the brand tag of "Delhi Memories", which have specially been designed by Ved apart from Indian handicrafts items and coffee table books on Delhi over quick bites. The cafes would remain open for 90 days and cover the period of the Commonwealth Games when a large number of tourists will flock to Delhi. The other highlight of the cafes will be its ability to provide information in eight foreign and Indian languages through blue tooth technology, touch screens and e-mail. The Kiosks will also offer street food and beverages of Delhi, which will be safe and hygienic. Further information has it that the stall near Red Fort has already made their menu with famous parathas, chaat, jalebi and lassi as its main constitutes. The menu hopefully will follow in the other cafes on similar lines as well. With an expenditure of 7.5 crore approximately, the chain will be mapped by 300 people and create temporary employment for 2,000 people. Kapil asserts, “The agreement may extend after the specified 90 days and creating permanent employment for the people of the city” otherwise, MCD will use them as government-to-citizen (G2C) kiosks. While applauding the move of Ved Pohoja Associates, the city will be marketed as a brand as the tourists will take with them “Delhi Memories”. Hopefully, the beads of information will facilitate the band binding Delhi while strengthening our ties and enhancing India’s image. Isn’t it a commendable move by the smart enterpreneur?